I've read that as a country we're losing our ability to feed ourselves and it's largely due to our dependance on imported produce. 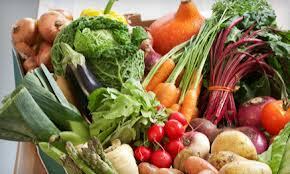 Super farms in South America and Mexico ship mass quantities of produce north relatively cheap. So cheap that local farmers are unable to compete and many are forced to give up on farming or turn to crops not intended for human consumption. I have also heard that some of the greenhouses around here are now not growing their own produce but importing it and packaging it for resale. I find this trend alarming. These super farms grow GMO's and they don't even employ a lot of people because of the huge machinery they now use. I don't need to tell you whose pocket the money goes into. Sure there are some things that can't be grown locally like bananas, but the next time you buy a cucumber and you have the choice of buying one produced locally or an imported one, buy local even if it cost a little bit more. Local produce is not picked prematurely and unripened to survive long transport and is much tastier and nutritious. Fresher IS better. You will help keep our farmers in business and keep the money in our own economy. Just sayin. Another thing we can do to lessen our dependance on imported produce is to grow our own in season and preserve the surplus for the winter by dehydrating, freezing or canning it. These have become long-forgotten arts that need to be revived! Almost everyone has a computer these days and if you have a computer you have access to information on how to do these things. There are many ingenuous ways to garden in small spaces including balconies. I myself would like to see more urban gardening including the (responsible) keeping of chickens for eggs and pest control! 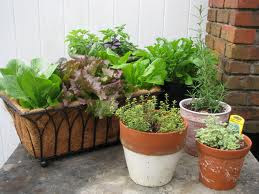 Start small - grow some herbs in window pots, plant a few tomatoes or peppers in patio planters. Gardening can be a relaxing and rewarding hobby. 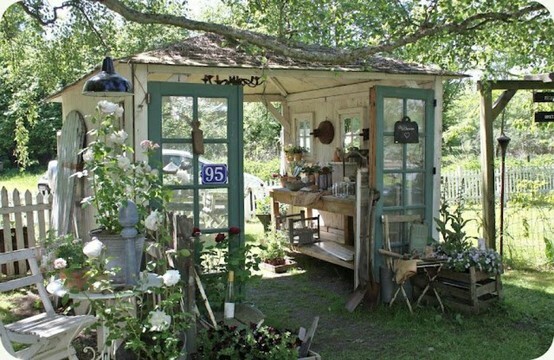 Don't you just love this open garden shed...I want! The concept of buying local should also extended to our other purchases. I try to buy products that are made in this country even if they are a little more expensive because I know they were made by people who earned a fair wage for their labor and it helps keep jobs in my own country. Buying local also helps foster a sense of community I think. Okay....enough of my rant! Please just give this some thought. Very thought provoking post. I think the hazards of not buying locally have really brought some chickens home to roost here in the UK recently with the horse-meat scandal. I think if we make a conscious effort to buy locally then we can at least have a modicum of surety about what we are eating, and yes, we support the local economy. There is nothing wrong with eating horse if that is what you are in to and you live in a country where that is the norm. There is something very wrong when you introduce it into the food system under the pretense of it being something completely differently. That is frightening to even contemplate and when you realize that it's happening, well that's even more horrific! What else are these people not telling us?? The mind boggles! Eat local and if you can . . . grow your own. Very good writing......Appreciations for you. At first i just want to praise the background and presentation of the writing. Its really eye catching and appreciable. I am 20 years old and 85 kg and doctor told me that it is just because of Hormonal Imbalance. .Now I am asked to lose weight fast plus with help of walk in morning as well as in evening for 2-3 hours and give some medicines. What are your suggestions in this regard? Thank you very much for your comments David. I don't find 85kg's to be too terribly overweight for a 20 year old man, and I think it is very achievable for you to lose a few kilos. Walking is a very good and gentle form of exercise and I urge you to do it daily, as weather and time permit. 2-3 hours per evening does seem a little excessive though and I would like to suggest perhaps a shorter time and incorporating a calorie-torch or interval walk. This is where you alternate between a normal paced walk and short, high intensity burst of speed. (not running - just fast walking!) For example, 2 min at a normal walking pace, then 2 min at a very brisk pace, then back to normal, etc. I don't believe in diets - they don't work in the long term and are usually too restrictive to stick to. Instead find a way of eating that you can enjoy and maintain through life, such as clean eating. Try to stick to whole, unprocessed foods that you prepare yourself, and eliminate added sugars or salt. This may take some getting used to because we become accustomed to our food tasting either salty or sugary. Learn to appreciate the natural taste of your foods! I can't really advise you regarding medications your Dr. may have prescribed. Myself, I am against taking medications that only treat symptoms and not the disease. Some medications may be life saving while others are just quick fixes to uncomfortable symptoms that allow us to continue to live an unhealthy lifestyle. Is your hormonal imbalance caused by an issue with your insulin? I hope you find some of these suggestions useful David and i wish you every success with this. Please let me know how it's going and if i can help in any other way!